I’m taking a break from my not-actually-a-blogging-hiatus here to share something interesting. You may remember my post from 2014 about the “Number Two (Pencils Shavings)” perfume from DSH Perfumes. It was designed to be a wearable essence and a scent for a room diffuser, though it never really struck me as really smelling like pencils. Well, there’s a new pencil-scented fragrance in town, and it’s also called “No. 2,” this time from Portland-based artists Rory Sparks and Catherine Haley Epstein. They combined their love of pencils and perfume into a perfect fun project. Rory, a listener of The Erasable Podcast, was kind enough to send me a sample for review. The sampler spritzer of No. 2, kindly sent to me by the artist. The pencil stub is a nice touch! I have to admit, the presentation is fantastic. My sample spritzer came wrapped with a short pencil stub to reinforce that the “No. 2” title was, in fact, referring to the pencil grade and not how people usually associate “number two” to smells. Here’s the thing. While this scent smells distinctly different than what I remember the DSH scent to smell like (though I don’t have that vial any more to compare), it still doesn’t really smell like pencil shavings. I suspected the problem may be mine, and not the perfumes, though, so I took it into work and shared it with some coworkers. Sure enough, I got a lot of comments about it smelling “woody” and a little “mineraly,” which I think confirmed that suspicion. My sense of smell is pretty out of tune. I blame years of bad childhood allergies and a perpetually stuffed nose and swollen sinuses. This scent was designed to honor the pencil. Like a pencil it is sharp, may be used as an under layer and blends in with just about everything. Yellow paint, splintered wood and metallic graphite serve as the springboards. The scent is made entirely of natural components of trees, leaves and citrus. Enjoy! Here’s the joint artist statement and a very cool personalized golf pencil from their ongoing art project. If you want more information on this scent-based art project, check out Catherine Haley Epstein’s website, MindMarrow, for her project statement. And, if you want to smell like you just sharpened 50 pencils (as I did the other day), head over to her shop for various volumes and packaging options of the scent. This is something I’m very excited about, folks. A year ago when we started Plumbago Magazine, as a paper companion to The Erasable Podcast, we just wanted to get some of our friends to submit drawings, or written words, or something that we could photocopy together into a few pieces of paper, folded and stapled. Then, last summer, Issue 2 came out, and we suddenly had 36 pages full of writing, illustrations, comics and more about pencils. We made 300 copies, which seemed like a lot, but — wow! — that quickly sold out. (You can still buy a PDF copy of that issue, though. For Issue 3, due out in January, I really wanted a whole issue dedicated to poetry and fiction. About pencils. I figured it would be slim pickings compared to Issue 2. But was I wrong! Folks, we have almost 70 pages filled with a dozen short stories, many poems, illustrations, comics, paintings, graphite art, and more! And we’re making many more copies, so I hope we can keep them in stock for a while. We’re trying to sell a bunch of copies, yes, but only because — okay, mostly me — am really excited to see this come to fruition. It’s been a labor of love for the last two or three months, and I couldn’t be happier with it. I’m afraid these won’t be available for Christmas, but my goal is to get orders out the first or second week of January. They’re being printed at a print shop, but the folding, stapling, trimming, and corner-rounding will be done right here in my one-bedroom apartment (Katie is thrilled, let me tell you). So place your order today. This is your chance to see the creativity and passion that runs through the internet pencil community. I don’t often have guest reviews on this blog, but when Harry C. Marks comes at me, I know it’s gonna be good. Harry’s an internet-friend who I’ve made sure to hang out with in real life several times, a long-hand novelist, and, like me, a stationery lover. 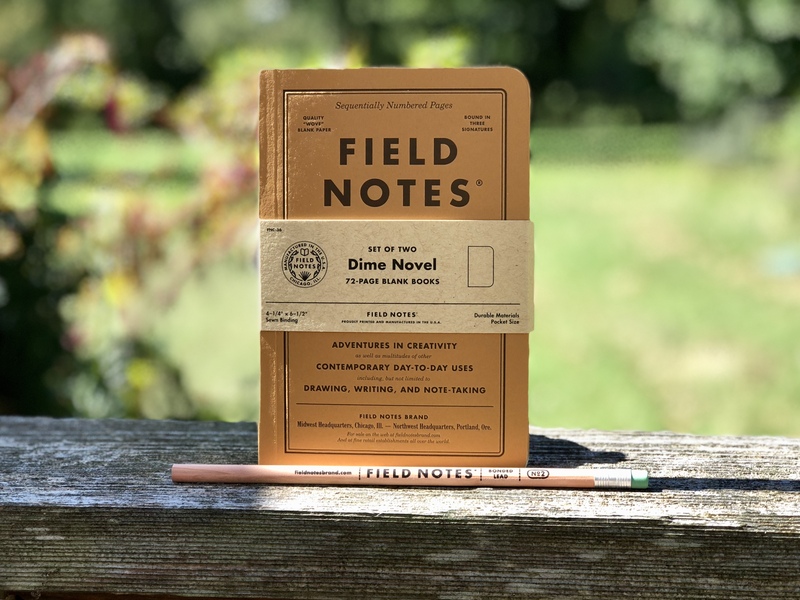 He recently reviewed the latest Field Notes release, Dime Novel. I’ve appreciated Field Notes notebooks for some time. I wouldn’t call myself a “fan” in the truest sense as I tend to skip most releases. Nor am I an obsessive collector, so when an edition comes out that captures my attention, it’s something special. The first Field Notes I ever bought were the Drink Local editions. The perfect notebooks for Fall in hues of brown and orange, fallen leaves scattered on the table. Even the covers crunched when I cracked their spines. Then came the Workshop Companion edition—six notebooks meant for six different kinds of projects, from woodworking to car repair. I’m not much of a handyman, but the package was too beautiful not to have on my shelf. Finally, there was Byline. This was it: the perfect Field Notes for me. A departure from their usual staple-bound pocket fare, the Byline was an extra-long, spiral-bound reporter’s notebook clad in a utilitarian gray and filled with some of the smoothest, creamiest paper I’d ever used. Its brutalist aesthetic concealed an inner beauty, 70 pages of gold between two layers of rock—and I craved more. I traded with friends, some sent me spare books in care packages, and I hoarded them among my growing collection. I thought I’d never find another book as perfect as the Byline. Then I opened my email last Monday afternoon. 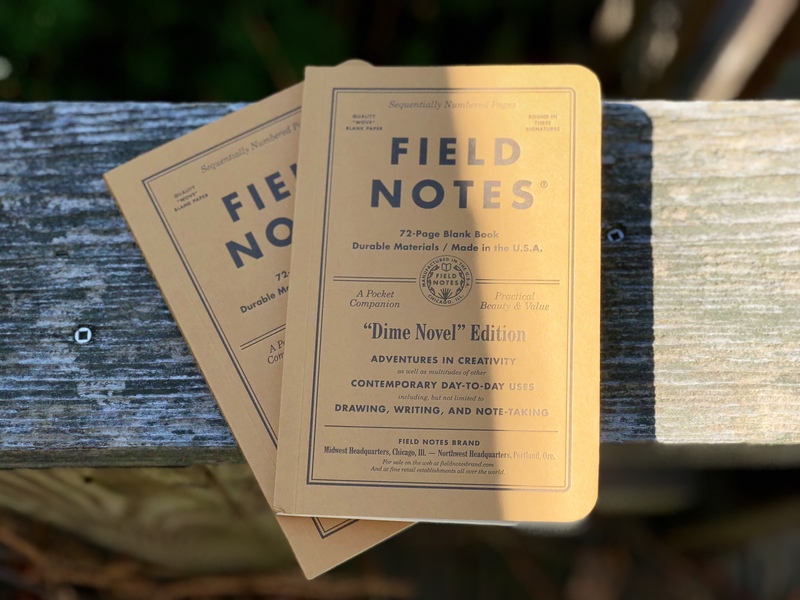 The Field Notes Dime Novel Edition is the company’s Fall 2017 release and the 36th limited edition in the lineup. Reminiscent of old dime novels of the 19th century, the notebooks stand at 4-1/4″ by 6-1/2”, roughly the same dimensions as their namesake. Three separate notebooks comprise the 72 pages within and are Smyth-sewn inside a thick, brown-orange cover. Field Notes is no stranger to experimenting with its covers. The blinding, aggressive Unexposed editions were better left that way. The cherry veneer of the Shelterwood put a tiny tree in everyone’s pockets. The Snowblind edition forced writers and note-takers out of the house as its stark white cover shifted to blue when exposed to sunlight. These gimmicks all had the same purpose: differentiation. No other pocket notebook had a wooden cover, nor one that changed colors in sunlight, and no company was blind-mailing subscribers random notebooks without first knowing the contents of each envelope. This is what makes the Dime Novel edition so interesting. The form factor is different from the usual lineup, but not so drastic as a Byline. The cover doesn’t have a pop-out ruler or foil coating. It’s just brown paper debossed with black ink. While more elaborate than, say, the America the Beautiful edition, it lacks the pop of some of the more intense covers mentioned above. That said, the Dime Novel cover isn’t simple. Within its black borders are lines of text meant to sell the notebook and illustrate its purpose. “Practical Beauty and Value,” “Adventures in Creativity,” “A Pocket Companion” all adorn the front, arranged to fill the space and yet be easily glossed over. 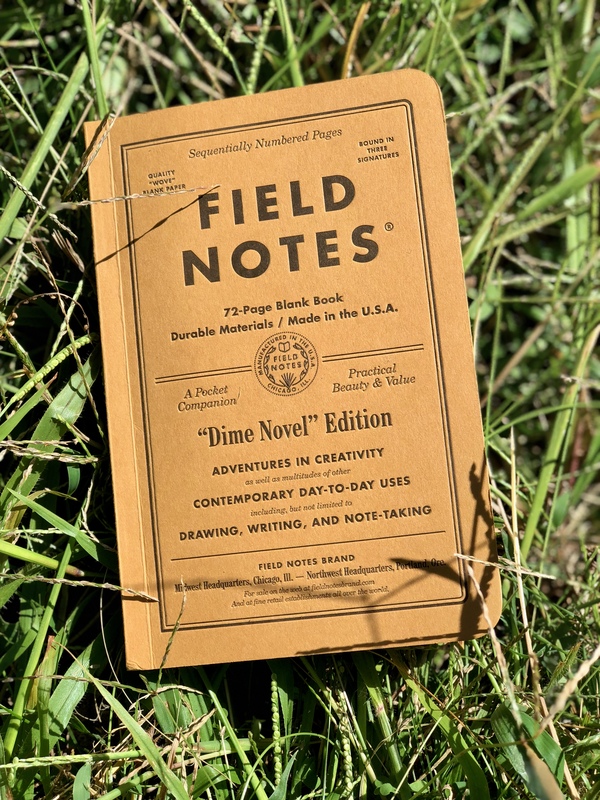 The two things that stand out are the words “FIELD NOTES” at the top and “‘Dime Novel’ Edition” toward the bottom. Everything else is white noise. The surrounding text provides dimension, but can be easily ignored. The original Beadle dime novel covers were not meant to be ogled. They were there to keep the pages from falling out. 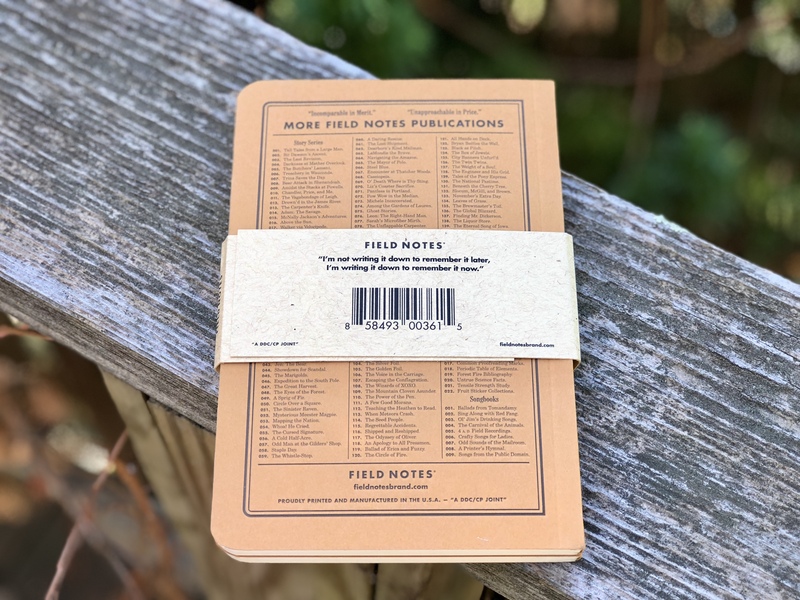 I see Field Notes’ homage in much the same light; the deceptively simple cover is there to protect your words and sketches, then get out of the way. What’s surprising about this edition is just how inspirational and aspirational it seems. This is a book begging to be written in and yet holding it, it feels too beautiful to sully with one’s own musings. How funny is that? A notebook modeled on cheap, mass market “literature” isn’t cheap looking enough for the average to-do list. The 72 numbered pages inside are a hearty 70# stock seemingly made for pencil. I tested the paper with a Blackwing 602 (firm core) and a Blackwing 24 (extra-firm core), as those are the two pencils I use most. The paper has a very slight tooth to it that grips the point tightly, but doesn’t erode it to a nub after a few strokes. Artists and sketchers will probably like this paper a lot, but I defer to them for final verdicts, as I do fountain pen users. As a pencil user, I’m pleased. This edition feels like a paperback in the hand. Given a few weeks in a back pocket, it’ll probably start to look more like an original dime novel than the crisp notebook in these pictures, with the cover crushed and faded like your granddad’s old hat. My only complaint concerns the blank pages. I’d hoped a notebook centered around literature would’ve provide writers with the lines necessary to write their own, but blank is more versatile. Fair enough. It’s probably my bias talking anyway—I almost never buy blank notebooks and I have no use for grids. NaNoWriMo is fast approaching and I’ve been outlining my first attempt in a Byline. I’d originally planned to knock out my daily 2,000 words in Scrivener on my laptop, but the arrival of these Dime Novel notebooks have presented a new challenge. With a guide slipped behind each page, might I tackle the Kerouac-ian effort of writing 50,000 words in one month by hand instead? The thought of seeing what could become a published novel get its start in a such a format is enticing. Even more so when I imagine the mason jar on my desk stuffed with Blackwing 24 stubs by the end of November. Whether I decide to tackle NaNoWriMo digitally or otherwise is yet to be decided. What’s certain is my lust for this latest Field Notes edition. These books will be used and for something greater than to-do lists. They deserve it. Sometimes, you don’t need to reinvent the wheel to capture the attention of a jaded group of collectors. Sometimes, you just need to make a simple, beautiful notebook—a work of art meant to inspire other works of art, and these notebooks have inspired me. Edit 10/04/17: The Paper Tasting packs are now live and available on the Yamamoto Paper Etsy shop! It looks like they’re selling for just over $11 each. Check them out here. A few weeks ago, I went to the San Francisco International Pen Show. Graphite representation was pretty low, but I was excited to hang out with some stationery blogger friends, like Ana Reinert from the Well Appointed Desk, and Brad Dowdy from The Pen Addict. In fact, I worked a shift at his Nock Co. booth, peddling fine nylon pen and notebook holders. I also met a really interesting guy — Taizo Yamamoto. He was visiting the US, and is sort of a Japanese counterpart to me and other US stationery bloggers — he has a podcast about stationery (called Hoji-raji, literally translating into to dig up, as in digging up interesting and backgrounds of stationery industry people), focussed on paper. (It’s all in Japanese, so I’m sad I can’t listen to it). Our mutual friend, Bruce Eimon from Think on Paper Co., introduced us (you may remember Bruce from my post about the Mitsubishi Uni Palette). Taizo and Bruce collaborate on a really cool product called Paper Tasting, which is really what I’m here to talk about. Well, it’s a sampler of different kinds of papers, organized in an expertly and tightly curated selection. It includes three samples of paper arranged in a theme — generally by color. But what is Paper Tasting, really? To me, each pack seems like a celebration of the visual and tactile capabilities of paper. Bruce and I have a sort of ongoing conversation about the Japanese philosophy around paper — they place a much higher regard on texture and thickness than US companies often do, which focuses more on ruling and economy. What do I do with these Paper Tasting packs? If you’re like me, they’re perfect for just looking at and playing with. There are so many more unique colors and textures in these packs than I’m used to seeing in one place. And if you want to tear them off, fold them up and try out different pencils, pens, markets and other utensils on them — go for it! I was lucky enough to get to try these packs out before their launch — according to the website, they’ll available for sale starting October 1. I’m not sure of the price, or how often they’ll be releasing new packs, but be sure to follow them closely. And if you can get your hands on the Blue, vol. 1 and the Yellow, vol. 1 packs — do. Find more information about Paper Tasting packs here, and check back in October for information on how to buy them. And thank you, Bruce and Taizo, for the preview! Just across the bay from San Francisco is Oakland, a city that often lives in the shadow of SF, but has so many cool attributes in its own right. On Sunday, I went to one of Oakland’s gems, the Oakland Museum of California. In addition to some amazing permanent installations, we saw a temporary exhibit featuring the photography of Dorothea Lange, a prolific documentary photographer from the early- to mid-1900s. She’s perhaps best known for her series on the displaced farm families as they migrated from Oklahoma to California in the 1930s, and on the forced internment of Japanese-Americans by the US government during World War II. The photography was powerful, the narrative was fascinating and there were really great interactive elements of the exhibit, featuring creative photo cropping, grouping photos to tell a story, and other immersive lessons. But the piece that really held my attention was a letter written to her by John Steinbeck just a few months before her death in 1965. He thanked her for the use of her photographs for a collection of articles he wrote in a pamphlet called Their Blood is Strong, about the Great Depression and American migrant workers. When I got up close to the display, I noticed that the letter was written in pencil! Its a bit hard to tell from this photo, but the marking is extremely dark. 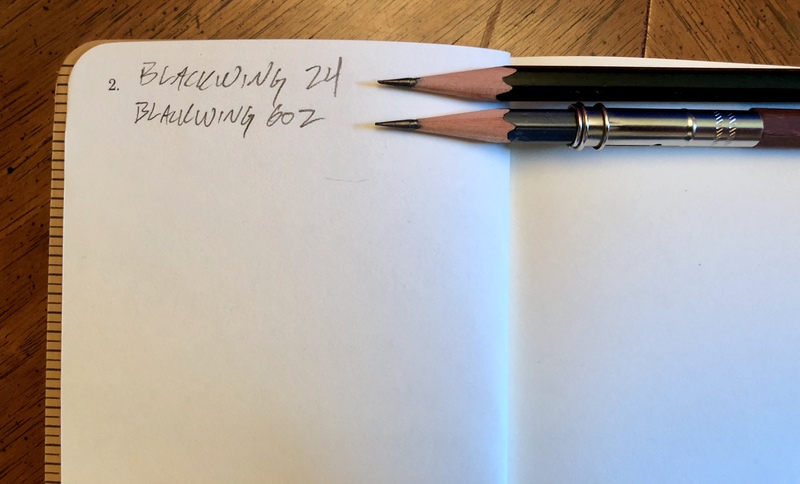 If Steinbeck was writing with one of his favorite three (the Eberhard Faber Mongol, the Blaisdell Calculator 600, and the Eberhard Faber Blackwing 602), I’d guess that it’d be the Blackwing. 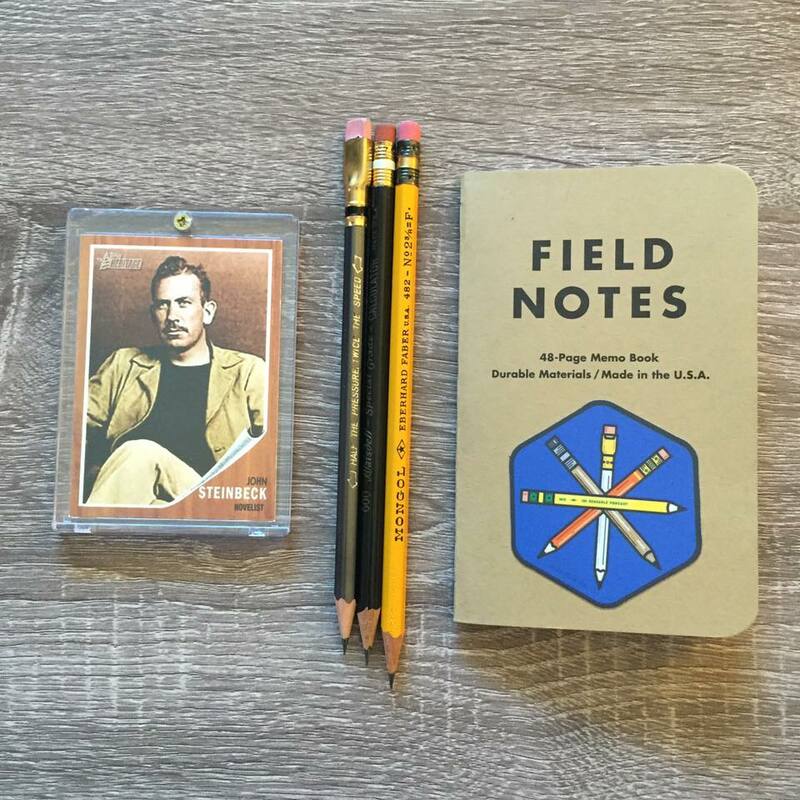 The Steinbeck Trio: three pencils lauded by Steinbeck, accompanied by a baseball card and an Field Notes pocket notebook with an Erasable sticker. We have lived in the greatest of all periods. If the question were asked, if you could choose out of all time, when would you elect to have lived, I would surely say — the present. Of course we don’t now how it comes out. No one ever does. The story ends only in fiction and I have made sure it never ends in my fiction. Notice how great Steinbeck’s handwriting was. It’s hard to believe, since he wrote so much by hand, that his pencilmanship didn’t degrade over time. But I guess when you’re writing a letter to one of “the giants” like Dorothea Lange, you slow down and take your time so your writing is legible. Even if you’re John Steinbeck. Thank you to the Oakland Museum of California for the exhibit, and for giving me the opportunity to see this artifact of an interaction between these two giants. 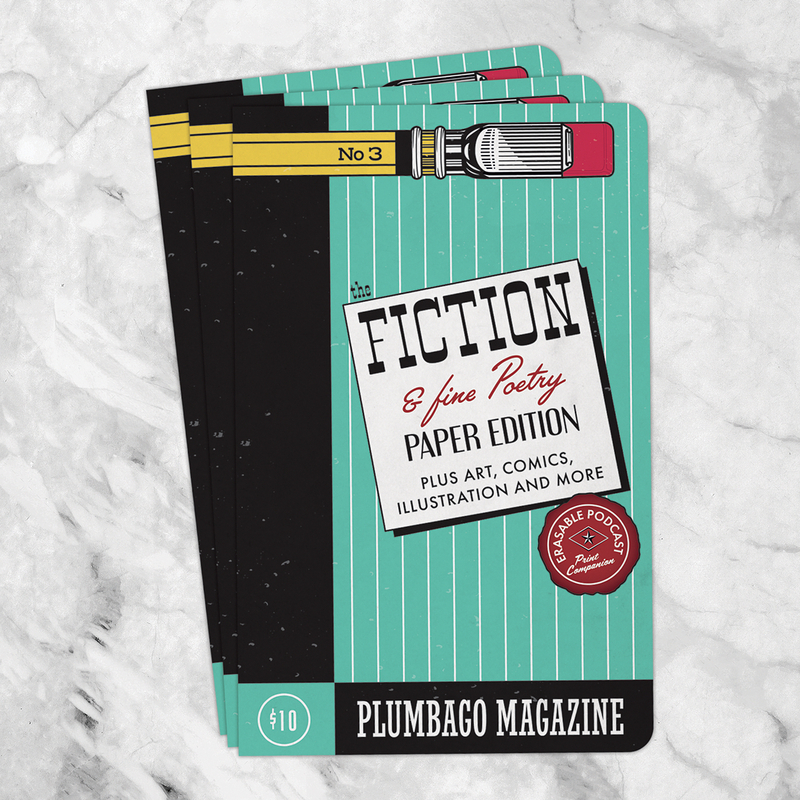 Plumbago Magazine, Issue 2 is for sale as a pre-order! I’m really excited for the second issue of Plumbago, my zine project. If you’ll remember, the first issue came out late last year. It was a bit rushed, since I was trying to produce an issue in time for a Zine Fest at the Facebook Analog Lab. Turns out, I made far too few copies, and because it was assembled entirely using the photocopier, several features in it were pretty heavily distorted. This time around, I wanted to produce a higher-quality issue, to see how that felt. Well, it feels pretty great! Weighing in at 36 pages full of photos, comics, illustrations, and written features, I present Issue #2! This isn’t a real image of the magazine, so the cover could look totally different than this. Just saying. This time, I need to spend a bit more money on producing the issue, so I opened it up for pre-orders to fund the initial print run. Please help out by placing a pre-order! This issue will be $10 each, but during the pre-order period, it’s $8. Head over to the Plumbago page on Erasable.us to order a copy now! One of the great ironies of wooden pencil merchandising is that for a product that’s a symbol — perhaps the symbol — of globalized industry, we see so few of the on the shelves in the United States. There are Ticonderoga pencils, of course, and Write Dudes. If it’s a fancy store, there are some Japanese and German brands, and of course there are bottom-shelf no-branded pencils. I barely even notice those anymore. But what about Indian pencils? This post is not a review of any specific pencil made in India. For that, you should check out in-depth reviews by my friends Mike at Lead Fast and Dee at The Weekly Pencil. You could even listen to the a recent episode of The Erasable Podcast where Mike talks about them. What I do want to do here is celebrate Indian pencils, and give you a few resources if you want to explore them on your own. What’s so great about Indian pencils? As Mike said on Episode 75 when asked this same question, they’re one of the best quality pencils for the price. And the way they use color and typography make it, aesthetically, much more interesting than the vast majority of the pencils you can buy around here. As iconic and trusted as the yellow pencil is in the US, it gets a little boring after a while. And for less than two dollars for a 10-pack, most pencil models are super cheap. Even if you spend that same amount shipping it over here. In a nutshell, they’re a breath of fresh air in a market where attractive pencils are usually extremely expensive (Blackwing and Tombow, for example) and inexpensive pencils are terrible performers and, well, just boring. My very favorite pencil shop in the world is Caroline Weaver’s shop, CW Pencil Enterprise. She has one of the best selections of wooden pencils in the US, with exclusive stocks of Viking pencils, Hindustan, and a few other brands. It was from her I learned about the Nataraj Pop, which I’ve written about here before, and a few others like the Apsara Joi. She introduced me, and a lot of my pencil-centric friends, to Indian brands like Nataraj and Apsara, both made by Hindustan Pencils, and the standard of what I think associate with Indian pencils. A few months ago, I got a message on Facebook from Suraj Singh, a pencil fan from Faridabad, India. He runs a small online stationery business, The Curios. Suraj is a member of our Erasable Pencil Community Facebook group, and wanted to know if the group would have any interest in buying Indian-brand pencils from him. Of course we would! He sent me a price sheet, and I realized there were brands I never heard of! Pencils with names like “Camlin Flora Chhota Bheem,” “Navneet Stallion Full Black” and “Rorito Trizy” stuck out to me. I wanted one of everything. Luckily, Suraj has a plan for that. He offers a sampler pack of either one or two pencils of every variety he offers, and for really cheap. I bought the 2-pack sampler which includes 110 or more pencils, for only $14.50! The full selection of what came in my package from The Curios India. All this for only $14.50! I ordered the 10-pack of Apsara Pop pencils separately. As soon as I opened the box, I was in love. Aesthetically, they came in varied, bright colors with contrasting end caps. Bold, foil-pressed typography with fun descriptive words (like “Learn with fun” on the Eco-buddy and “Neat & Dark” on the Rorito Quicky). There was a high percentage of triangular pencils, which Ive always been into. It’s just an explosion of color and fun, which I don’t see a lot of around. The colors, the designs, the typography, and the words on these assorted Indian pencils are unique and just so delightful to me. Sure, the high-end pencils that go around our community are beautiful — the newest Blackwing Volumes edition celebrating Lake Tahoe is an example of the aesthetic beauty that special, high-end pencils can bring — but these Indian pencils are something else. They’re maybe not as polished and “special” in their design. Their bright colors are commonplace, which really appeals to me. Without stereotyping too much, I would say Indian pencil that advertise as being “extra dark” write a bit lighter than Japanese pencils of the same. They aren’t quite as exacting in their core grading (one pencil has “HB+” written on the barrel — what does that even mean? ), but at a fraction of the price, I don’t expect them to be. How do I get some of these pencils? If you want a box of assorted Indian pencils, reach out to Suraj. The easiest way is probably through his Facebook Page, though if you dont use that platform, you can email him, too, at thecuriosindia@gmail.com. If you’re in the US, just remember that shipping will likely cost more than the product itself, and still take a couple of weeks to arrive. That’s pretty standard and expected. He also sells those pencils by boxes of 10, if you know what make and model you’re looking for. If you’re looking for one or two pencils of more limited availability, perhaps to add to a larger order of other pencil ephemera, head over to CW Pencils. They have a smaller selection, but some of the best, like the fabulously hand-marbled Nataraj Marble Pencil or the Apsara Absolute Extra Strong. There are lots of assorted sellers on Amazon, but at this point, I don’t know enough about them to recommend them. They seem to offer pretty good prices, often with shipping built into the cost, but often, they seem to be much slower in shipping than the two sellers I mention above. Buy from there at your own risk.